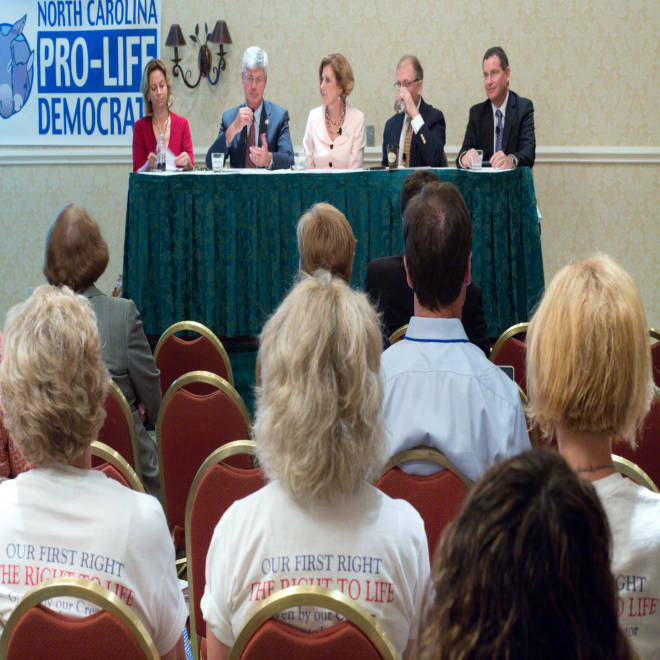 A panel discussion held by Democrats for Life in Charlotte, North Carolina on Tuesday, one of many events organized around the Democratic National Convention. CHARLOTTE, N.C. – Small, shrinking (at least in its congressional representation), and sometimes forgotten, the wing of the Democratic Party that wants to limit or ban abortions is still trying to assert some influence here at the Democratic convention in Charlotte, N.C.
“We are members of the Democratic Party. We are pro-life and we are proud of our position as pro-life Democrats,” Kristen Day, executive director of Democrats for Life of America, told a group of about 40 people at an event Tuesday. But, she contended, Democrats can’t win seats like the one she held for one term in Erie, Pa., without running anti-abortion candidates. Elected in 2008, Dahlkemper was swept out in 2010 in the 2010 GOP wave, losing to Republican Mike Kelly. 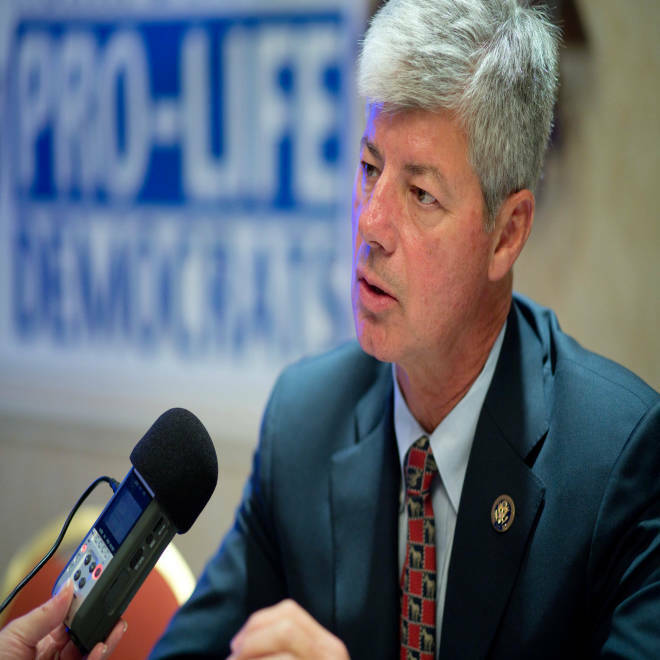 “We will never get to be a majority again unless we have pro-life Democrats,” argued former Michigan Rep. Bart Stupak, who retired in 2010 and is on the board of Democrats for Life. Democrat Bart Stupak, a former US Representative from Michigan, talks to reporters following a panel discussion held by Democrats for Life in Charlotte, North Carolina on Tuesday. Thirty-five years ago when the Democrats enjoyed a 292-seat majority in the House, there were 125 anti-abortion Democrats – including a young Rep. Al Gore of Tennessee. Now there are only 17 anti-abortion Democrats and districts such as Gore’s are now represented by anti-abortion Republicans. You would not know they exist from the speakers’ line-up at the convention. Given speaking slots Tuesday night: Nancy Keenan, President of the National Abortion Rights Action League and Secretary of Health and Human Services Kathleen Sebelius. Democrats for Life opposes Sebelius’s health insurance mandate because they say it requires companies and insurers to provide contraception coverage to workers, including certain types of “morning after” drugs that Stupak and anti-abortion activists say induce abortions. 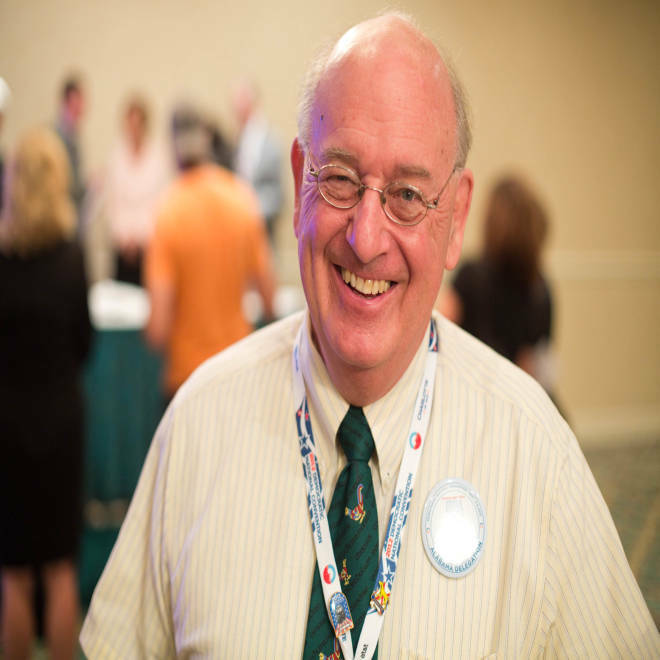 “The abortifacients are the big issue for me,” said Dahlkemper. Stupak said that Sebelius’s contraceptive mandate violated both a 2009 law and the executive order which Stupak negotiated with the Obama administration that was designed to ensure that no money in the Affordable Care Act goes to subsidize abortions. That accord was what allowed Stupak, Dahlkemper and other anti-abortion House Democrats to vote for the Affordable Care Act. "The only problem with pro-choice is that it's no choice for the one and only life at stake," said Alabama delegate Julian McPhillips, attending a Democrats for Life event in Charlotte, North Carolina on Tuesday, one of many events organized around the Democratic National Convention. He and his wife adopted a one-day-old boy 21 years ago from a mother who McPhillips said had intended to get an abortion until he convinced her to continue the pregnancy and give the baby up for adoption. Given how marginalized the anti-abortion Democrats are, a natural question is: What is it that keeps them in the Democratic Party? Dahlkemper answered that Tuesday by noting that she’d voted for the Obama stimulus bill, the Dodd-Frank Wall Street regulation bill, the repeal of the Don’t Ask Don’t Tell policy on gays in the military, and of course the Affordable Care Act – which she argued “will significantly reduce the number of abortions in our country,” because it broadens Medicaid eligibility and provides funding for pregnant women’s care. “My votes in Congress put to rest any lingering idea that I am not a true Democrat,” she said. And Democratic anti-abortion activists contend that Mitt Romney would be a worse president on protecting unborn life than Obama has been. Stephen Schneck of Catholic University in Washington told the gathering that “the number of abortions will skyrocket” if Medicaid spending is cut, which would be one likely outcome of adopting the budget plan of the GOP vice presidential candidate, Wisconsin Rep. Paul Ryan. “Can a pro-life voter vote for Romney if it means a 6 or 7 or, God forbid, an 8 percent increase in the number of abortions in America?” Schneck asked. Patrick Kennedy and Edward Kennedy, Jr., discuss their father's legacy on politics. A few hours after Democrats for Life held its panel discussion Tuesday, a larger group of Democrats – roughly ten times as many – showed up at the NASCAR Hall of Fame in Charlotte for a raucous rally in support of abortion rights. One of those Democrats with a front row seat at that rally, Annette Jurgelski from Hillsborough, N.C., whose husband is a retired doctor, said one reason she favors abortion rights is that when she and her husband moved to North Carolina for his medical training at Duke University, abortion was still illegal. But at the moment there seems to be little effort on either side of the abortion divide in the Democratic Party to bring people such as Jurgelski together with those such as Dahlkemper to seek harmony. In Charlotte, each group went to its own events.